Crown-of-thorns sea star are magnificent animals, growing up to 80cm (30 inches) in diameter, with up to 20 arms covered in 4cm (2 inch) long spines. Each spine is coated with a toxin that released on contact with human skin. This can be a very painful ordeal, especially if you get spines stuck in your joints. The crown-of-thorns' spiny skin and internal hydraulic system, which drives hundreds of tube feet in grooves under each arm, lends it enough agility to move around and over almost any coral colony. Once it finds living corals, it turns its bubbly white stomach inside-out, over the living tissue, digesting it off its skeleton. When finished the crown-of-thorns moves on, leaving a round white scar. Usually it feeds by night and hides by day. Small crabs will nip at its tube feet to keep it off branching coral; harlequin shrimp will attack and eat it, as do triton shells and triggerfish. Crown-of-thorns have an incredibly agility to regenerate from just one severed arm and part of the central disc. This coral-killing beast can aggregate in the millions on one reef while, on another reef, form small chronic populations that slowly kill the coral. Each female can release up to 60 million eggs each breeding season. Egg survival may be enhanced by El Nino, coastal run-off or many unknown factors. Reefs usually recover, sometimes only to be eaten again. Why so many outbreaks throughout Indo-Pacific reefs? That's the big question that many hypotheses try to address. 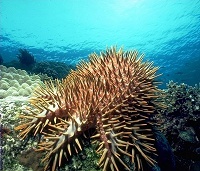 Linneaus named the crown-of-thorns in the 1700's, although some geologists say that spines found in the reef sediments indicate outbreaks more that 5,000 years ago. Recent data collected by scientists and Marine Park staff will slowly shed light on the "hows and whys" of this fantastic creature and its distribution. Since the creature has only been constantly observed in the 30 years, there is still so much to be learned.